Daily Illuminator: Demo Ogre: Objective 218 At Little Shop Of Magic! June 11, 2016: Demo Ogre: Objective 218 At Little Shop Of Magic! 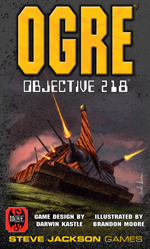 The release of Ogre: Objective 218 is imminent, and to win you're going to need to prepare. So why not learn it early! We've selected a few stores to run early demos of the game, to help get you up to speed before the game comes out. These training sessions should get you acclimated to Missile Tanks, GEVs, and even the Ogre Mk III to conquer your opponent's base. Little Shop of Magic in Las Vegas, NV is the first proving ground! Starting Saturday, June 11, 2 p.m.-3 p.m. and 4:30 p.m.-5:30 p.m. (TODAY! ), swing by the store and get a taste of the tactical action of Ogre: Objective 218! Little Shop of Magic will also be holding more demos on Sunday June 12 from 11:00 a.m.-12:00 p.m. Each weekend in June will be have more demo times, so check their schedule! Once you've learned how to play, preorder in store to make sure you secure a copy for yourself when it releases later this month. Keep an eye on this space, as we'll be announcing more demo stores across the country. And if you don't have a store near you, check out our How To Play video on YouTube!